Do fathers and mothers have different roles in parenting? It’s interesting that in Ephesians 6 Paul says, “Children, obey your parents,” not just your dad. And then it gets to fathers and says, “Fathers, bring your children up in the nurture and admonition of the Lord.” So I think there is a “both/and” in the Bible. Both mom and dad are responsible to give commandments and give teachings. The book of Proverbs talks about the teaching of a mother as well as of a father, so a parental team confronts this child with the will of God and with godliness. And when it comes to discipline of the children, the way that this uniqueness comes out is that dad assumes the buckstopping, initiative-taking role. 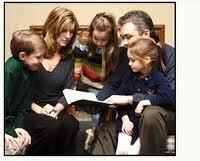 A child ought not to see that mom is always the initiator of discipline or devotions or of special family activities. That’s going to breed into a child a sense that their dad doesn’t get it, or is weak, or is not the spiritual leader that he ought to be. Dad, while not doing all the devotions or discipline or leading, is supposed to be the initiator and buckstopper. So I sometimes say to couples, “Who says ‘let’s’ more often in your family? Let’s get to church on time. Let’s eat out today. Let’s talk about the finances in this marriage.” And if the wife is always having to say, “Let’s have devotions, let’s discipline the children better, let’s go to worship,” and the dad is always responding or is always recalcitrant, then something is amiss there. A wife loves to have a husband, not who domineers or does everything, but who takes creative initiative. And if there is crisis with the kids or with the finances, he says, “Let’s talk.” And then he wants to hear what she says. Now she may have greater wisdom on the issue than he does, but he takes the initiative to get it done. However, I back off a little on essential to say for single moms and single dads that God can take an imperfect situation and provide that essential component so that the kids can grow up in a wonderful way. In fact, I just had dinner with a single dad and his two sons about three weeks ago, and I just stood in awe. I didn’t probe into what had happened—she had been gone a long time, and it wasn’t a death, so there is obviously some crisis there. But I looked at these two boys, one in college and one just finished with college, and thought, “This dad has done something really good here.” God can make the difference.